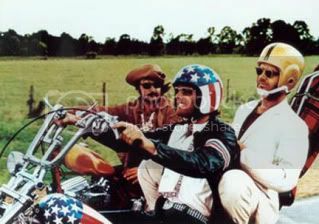 As I read through reviews of Easy Rider upon its release, I can’t help but smirk at the irony of it all. These older critics attempt to reconcile their (mis)understanding of youth culture by explaining how Easy Rider really doesn’t go anywhere and has very little to say. Even their praise seems half-hearted and backhanded. Roger Ebert and Vincent Canby deride Easy Rider’s opening half as merely frivolous and inconsequential to the larger narrative arc (or as Ebert states: If you follow the story closely in "Easy Rider," you find out it isn't there. Perhaps it’s the benefit of hindsight, but I found much of Easy Rider’s first half to effectively explore a sort of transient culture that I can’t say I directly relate to, but to some degree, understand and even revere. I found it far more effective than its second half where the film attempts to reconcile its quiet observations on America for a more straightforward and overt narrative arc. The benefit of watching something like Drive is that it preps you for a sort of existential journey that Easy Rider takes to heart. Like the main character of Drive, Peter Fonda and Dennis Hopper inhabit the narrative space in a way that makes their journey seem larger and more grandiose. The film almost frivolously establishes how their characters manage to survive in the world (they buy drugs from Mexicans, sell them to Americans) and from there, we move forward. The sounds of Steppenwolf and Jimi Hendrix illuminate the setting as Fonda and Hopper move from site to site, with the American landscape establishing itself as a character in itself. 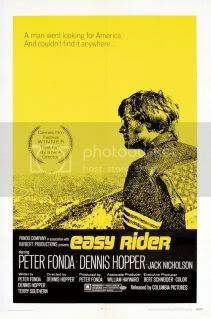 Easy Rider develops its “story” upon the introduction of George Hanson (Jack Nicholson) – a drunken lawyer who meets Hopper and Fonda in jail. He joins the gang on their existential trip to nowhere, wherein he spells out the larger narrative purpose of the film. It’s a bit on the nose – he notes that the gang represents true freedom and therein causes the spread of fear and misunderstanding amongst those tied to the system. I could ask for a little more subtlety to such a scene, but I must say, Nicholson absolutely sells this moment at the campfire that I forgive any lapses in the film’s subdued approach. And from then on, we see the results and contradictions in such irrational fear. Hopper’s direction is a bit uneven at times, particularly as he moves from scene to scene. There’s an editing technique that is applied to Easy Rider that I simply find too dated and distracting to come across as effective too. This minor quibble doesn’t really harm the film all too much, but I must say I found it particularly difficult to get past even as the film was reaching its conclusion. But in all, the film is a remarkable feature that is ultimately notable for its earnest (if naïve) sense of striving for freedom.